I can see about 5 remotes, bunch of wires and some other devices I can not recognize. Any chance you are playing with lirc these days? 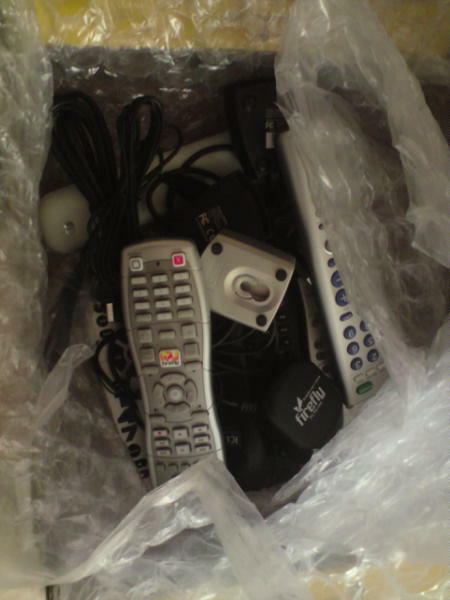 Yeah, it's 7 new remotes and the receivers that go with them. Including some that plug into the microphone input. Eeek. I had a go at configuring LIRC for a remote recently, and it reminded me of trying to get things working under Linux 10 years ago. Having the events get through to the application via input layer would simplify things enormously. The next thing would be to automatically recognise the remote control codes, but I assume that is a bit more difficult given the large variety of remotes. LIRC is quite hard to setup, and the work Jarod and Mauro have been doing is moving most of the handling of remotes into the kernel. We still need XI2, and support for Linux keycodes higher than 256 in X.org and the toolkits before we can just rely on the Input Layer, rather than LIRC. For the common case of the remote coming with a specific receiver, we should be able to do most of the work in the kernel (as I did for the Apple Infrared Receiver in Macs).